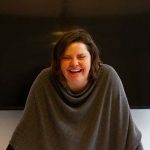 In de Neuland®-Blog informeren wij u over nieuwigheden, nieuws en interessante dingen uit de product - en themawereld van Neuland®. We delen nieuws uit het veld, web bevindingen, handleidingen en downloads. Heather Lettering Martinez visited Neuland® headquarters. What they plotted with her there, that’s still top secret, but a few paparazzi have leaked secret photos. You don’t know Heather Lettering Martinez? For us she is THE Lettering-Queen. Click here, to find out more. Here you’ll learn how to do the handlettering with our markers. At the [...]The post Heather is here! An exclusive report from the Neuland® headquarters appeared first on Neuland-Blog EN. 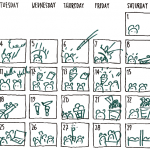 Ever thought about using our Neuland® Calendar as a storyboard for your stories? Hanno Langfelder just did that now and told a picture story to his five-year-old son. Incidentally, the day boxes are perfect for that. A bedtime story on the Neuland® calendar Story: Small creatures have a challenge They want ice cream and [...]The post Customer Tip – Using the Neuland® calendar as a storyboard appeared first on Neuland-Blog EN. I’m happy to send you the very first update from Cape Town. I arrived on Friday afternoon, but lots have happened since! 🙂 On Saturday morning I did a graphic recording/graphic facilitation in Salt River, for a South African community organisation. 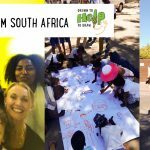 I find it fascinating that within the last two weeks, where I travelled to [...]The post Drawn to help to draw – Postcard by Mona from South Africa appeared first on Neuland-Blog EN.